Teaching With a Mountain View: Christmas Time Is Here! It always seems like the months before Christmas are such a whirwind. Add in the fact that my twins turned 2 on Thanksgiving day, and I have no idea where the last 2 months have gone! 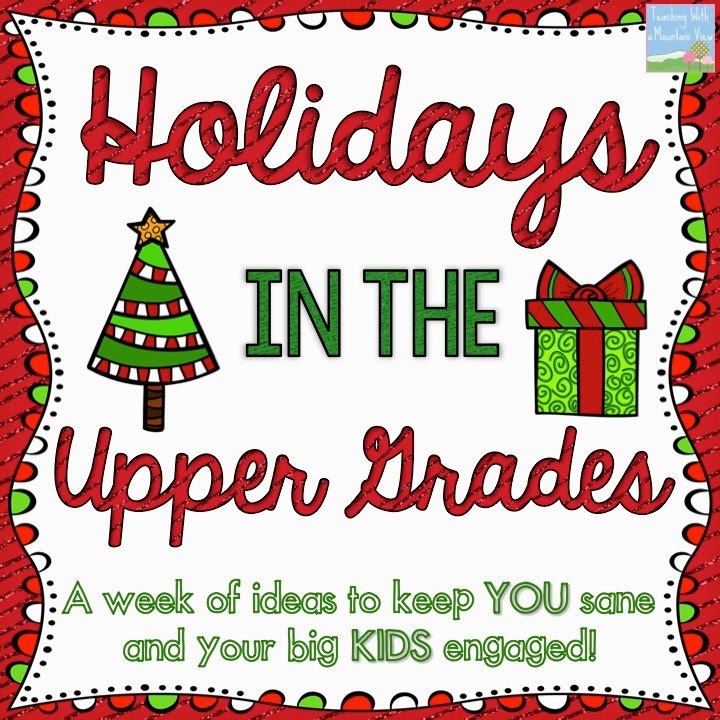 I have tons of pictures and activities from my classroom over the last couple of months, but I wanted to share a few holiday goodies while they still might be useful to you and your planning! I have always loved Christmas, and I can still feel the excitement bubbling in my chest when I think about heading out for recess and walking back into a classroom transformed into a magical Christmas party. We would craft, eat yummy treats that parents had made, and it seems like there was always Christmas music involved. 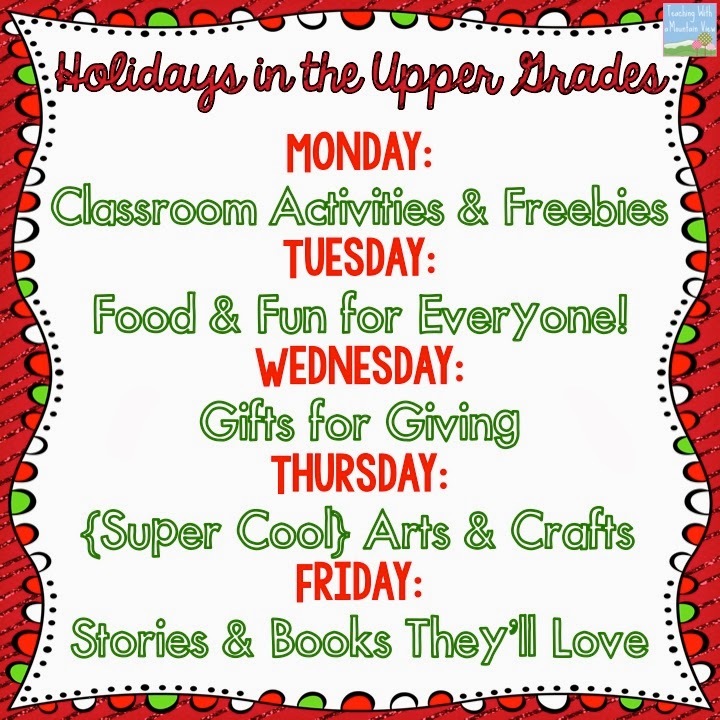 I remember the pencils and erasers my teachers would give us as gifts, and the excitement I felt after Christmas break, wanting to share all about my adventures and new toys with my beloved teachers and friends! 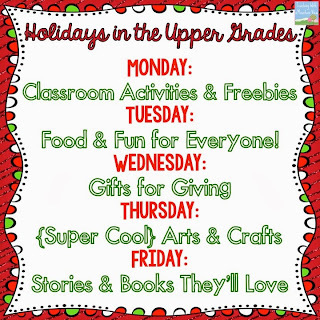 Even though we have some restrictions now about how we can celebrate the holidays (including some pretty hefty food restrictions), I am determined to make it as special and memorable as I can...But, the learning must go on! (Especially when we have already had 3 snow days this year). I have been busy creating products and finding fun snacks and activities that won't break the bank! I am so excited to share the next two weeks with my students. I only have time to show a few little things we are beginning this week, but you can pick up a freebie or two (or three if you really dig deep) while you are at it! 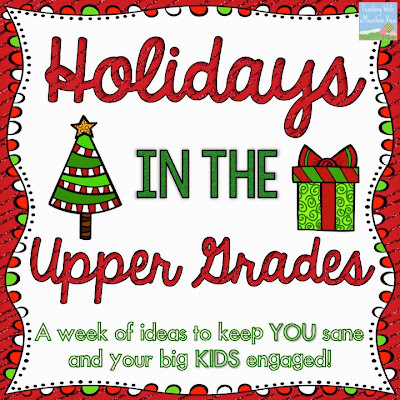 Come back every day to check out my week-long holiday feature: Holidays in the Upper Grades. Also, check out the other bloggers who have linked up at the end of the post for more great holiday ideas! With my third grade enrichment group, we are finishing up 2 digit by 2 digit multiplication. I only get to see this group once a week, so it has been slow going. 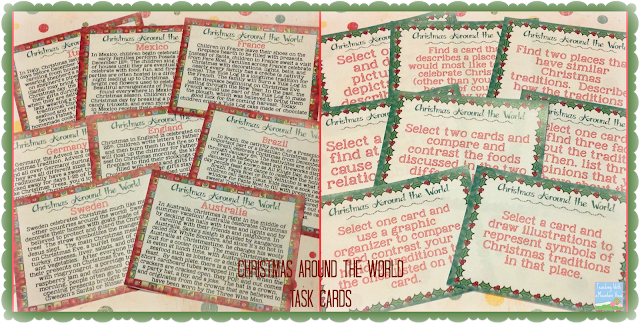 I really wanted to do something festive, so I pulled together a quick set of task cards. 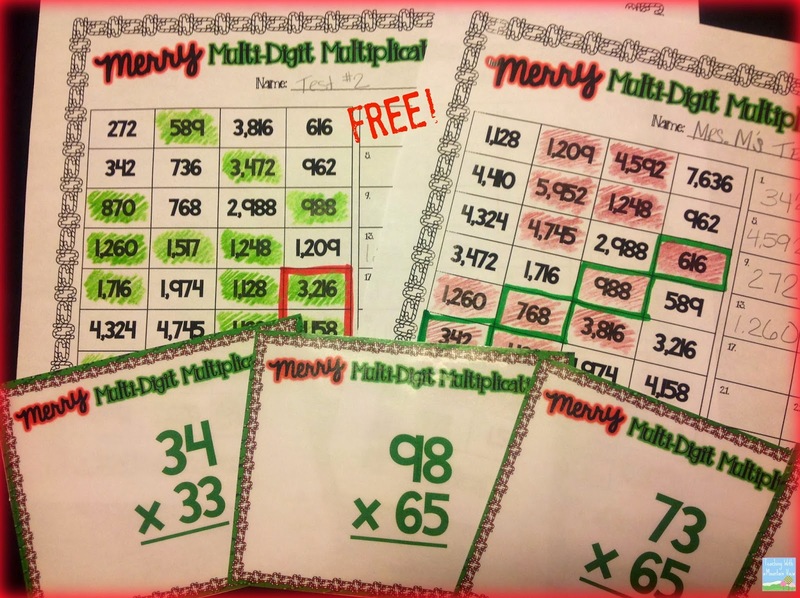 I keep trying to think of new ways to use task cards, and so I created 5 different answer sheets that students can play like bingo. With my older groups, we are going to be working on a project called "To Grandmother's House We Go." I am so, so excited about this little creation of mine, and I am thrilled to show it to my kids. They are all copied, stapled, and ready to go. We will be spending the last 3 days before break on the project, which covers tons of different upper grades topics, including elapsed time, multiplication and division, fractions, graphing and data, problem solving, and more. It is the perfect thing to review so many different concepts before they do a brain dump over the winter break! You can purchase To Grandmother's House We go HERE! I am planning on having special treats for my students each day that we work on the project. I have been busy pinning ideas on Pinterest for those treats. Before I do a great, big food post tomorrow, you can sneak a peek at my ideas on my Holiday Pinterest Board! One last treat before I get started on putting together my student's holiday treats (look for that post soon)! I made a little Christmas Around the World set of Task Cards to use with my groups. 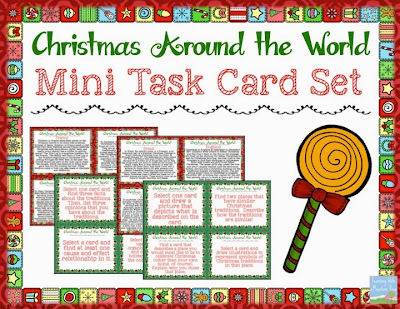 Each table is going to get their own set of cards and tasks. I don't have a lot of time to devote to Christmas Around the World, but I still wanted to cover it, so this is what I came up with. It's only 4 pages, but I certainly hope you can use it! It's FREE at my TpT store! Happy Holidays! Come back soon for more holiday inspiration. I love your ideas. I wish we weren't testing the last week before break!!! A whirlwind for sure...so much in such a little time! Thanks for your blog. Smiles and stop by anytime! 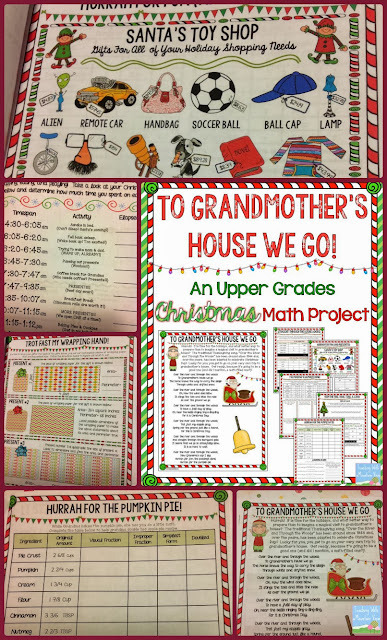 I am SO excited to use To Grandmother's House We Go project with my fifth graders this week!!! 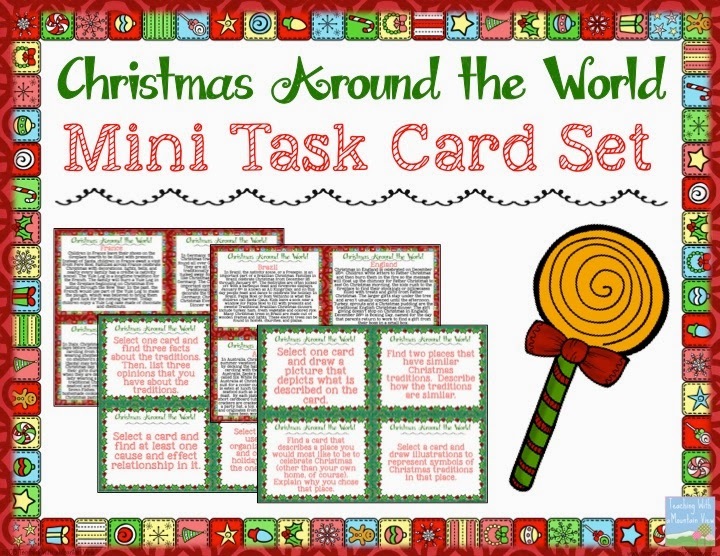 I also spent the last week laminating and cutting out the Christmas reading task cards. Thanks for helping me make the next week breeze by (hopefully). Amazing your idea.That is a great writing. "Christmas Time is Here" is a glorious tribute to the music of Vince Guraldi. I felt like I was viewing "A Charlie Brown Christmas" as I listened to the first piece of the CD and on occasion even overlooked I was listening to a metal outfit and not a jazz troupe. Despite the fact that they deviate from the smooth jazz style a bit with tunes like "You're A Mean One, Mr. Grinch" and "Rudolph the Red Nosed Reindeer," the collection closes pleasantly with a repeat of "Christmas is Coming." Merry X-Mass!